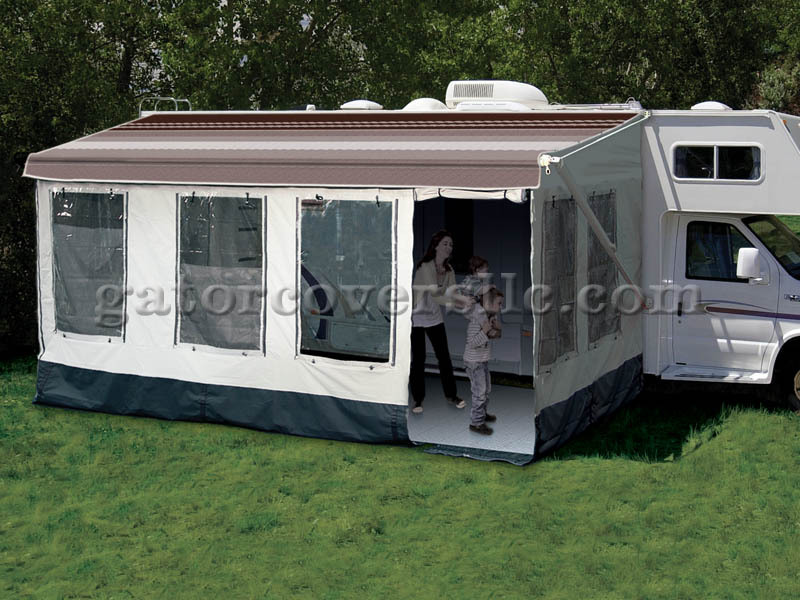 It may have a small storage footprint, but the Buena Vista RV awning room opens up big. This room fits traditional manual and motorized patio awnings 10-21 feet wide with 8 foot extensions and 86-120 inches between the awning rail and the ground. Made from strong gray tent material. Quick and easy setup. Less than 15 minutes. Mount the door on the left or right side. Extension panel for odd-sized rooms included. Includes room, one-piece skirt, ground stakes, two rafter arms, tote style storage bag, small storage bag for stakes, and installation/owner's manual. Zippered clear weather-view panels on the outside for weather protection. Zippered interior panels for privacy. No drilling or dealer installation required.